As the store of appliances, stoves, small jars, cookware, flatware, and everything in between, the kitchen is one of the most terrible places in the house to keep organized and maintained. Organizing the kitchen and maximizing it for space and utility can be a never-ending nightmare for most people. You want the kitchen to look spacious and clean, yet have little to no storage space to keep everything tidy and clean. Small accessories, tins, food cans, boxes, bags, books, everything requires its space in the kitchen. At such times, it is not possible to merely chuck everything out. You must become innovative and creative in finding space from what is available for use. It is not always financially viable to remodel and expand the entire kitchen. While you may think of this the next time you are renovating the house, it might not be a feasible solution right now. You need to find ways to organize and store pots, pans, and pantry staples while increasing available space to look good. Let us look at ways in which you can increase the space and look of your kitchen without it drilling a hole in your pocket. Pantries are always overrun with food items and staples. Organize everything into baskets and pull out drawers. If you have an old-fashioned kitchen, consider buying cheap, colorful racks with small wheels that can be moved around to organize your staples. Use your door space and add pocket doors and attach baskets to your door to hang fruits and dry veggies like potatoes and onions. Increase your shelf space by adding a magnetic backboard to connect tins and food cans so that this method clears the shelf space and gives you room for more storage. The pantry is a good place to store your kitchen bin otherwise, since bins can make a room look bad. 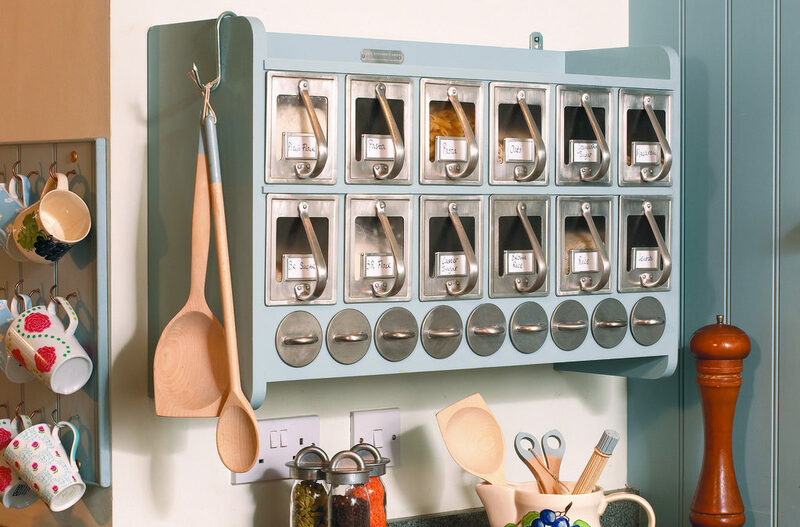 Instead of keeping your utensils in an open rack, opt for a drawer to store and organize all your tools. Keep the smaller vessels and utensils inside the larger ones and save them one inside the other to optimize your space. Keeping these separately might take up precious space to store other items of value in your kitchen. A built-in utensil drawer can also hold your silverware, kitchen knives and crockery to one side and save space elsewhere. Keep all the spatulas, tongs, cooking forks, slotted spoons, and so on in a thick stainless steel pot so that you can find everything in one place and they won’t get scattered. Most people do not realize the importance of the under sink drawer. You can store all your cleaning supplies safely under the sink while ensuring they are out of reach of children. Like earlier, place a pull out wire rack with wheels and put all cleaning supplies in the tray. 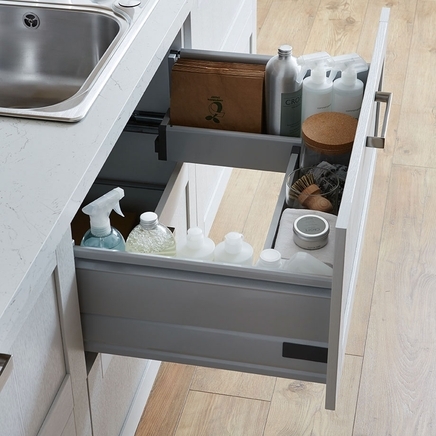 Easily accessible to you, the cleaning drawer can easily hold dishwashing detergent, clothes detergent, bathroom supplies, glass cleaners, wood polish, and dishwashing liquid. You can also put a two-tiered rack and keep napkins, scrubs, wire meshes, and gloves that are used while cleaning the house and kitchen. Dishes are usually the last to find space in the kitchen. By adding extra shelves to existing drawers and racks, you can safely store all dishes and flatware. Create a drawer with adjustable pegs that can be moved around according to your requirement and sizes of plates and baking dishes. Having the flexibility to adjust the dish drawer leaves space for adding newer things and readjusting older ones to keep everything organized neatly. This also helps improve visibility while searching for a particular item in a hurry. Make maximum use of the space available in display spaces. Keep expensive crockery, silverware, and flatware in display spaces. These double up as showcases and storage units. Wall rack with stoppers that won’t topple over with kids and pets running around the house is ideal. Many times, display racks work well in showing off your beautiful kitchenware while adding to the beauty of your home. Wet sponges, dishwashing liquid, and scrubbers make the sink area look extremely cluttered since they are needed all the time. Instead of keeping these things around the sink, you could purchase good-looking yet cheap desk organizers and hang them on the nearest wall cabinet or wall of the sink to get the stuff off your sink edge and countertop. Make maximum utility of this underused space above and around the tub to store everyday things like bottle scrubbers, wet sponges, and dishwashing liquid to turn your sink into a clean zone.